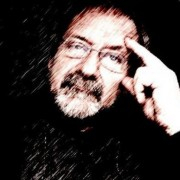 Dr. François Desjardins, author of the General Technology Competency and Use (GTCU) framework. 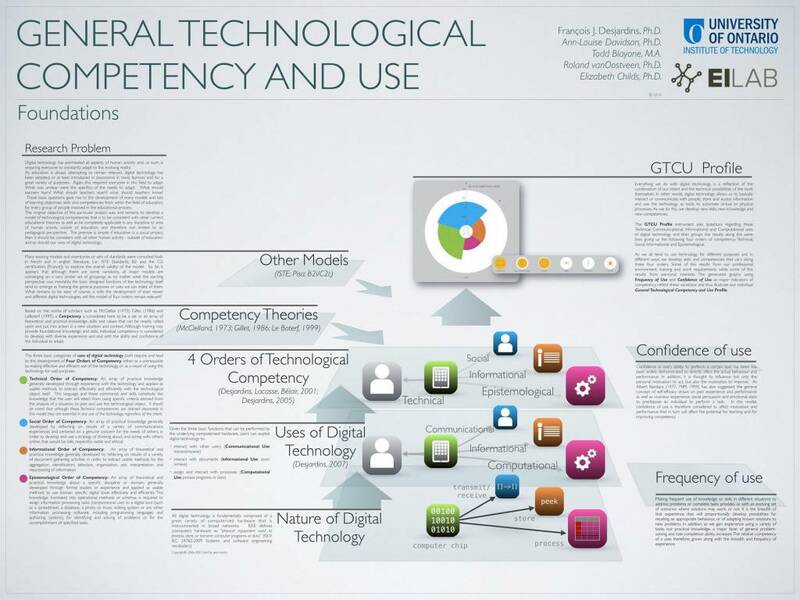 Developed in Canada and authored by Dr. François Desjardins, the General Technology Competency and Use (GTCU) framework conceptualizes digital-technology abilities across three primary dimensions: Epistemological (E), Informational (I) and Social (S). These dimensions are explicitly aligned with the IEEE definition of computer hardware: “physical equipment used to process (E), store (I), or transmit (S) computer programs or data.” The GTCU offers researchers and educators a streamlined model with demonstrated effectiveness for surveying the digital readiness of individuals and groups for technology-enhanced working and learning. The GTCU overlaps conceptually and operationally with other academic, digital-abilities frameworks like that of Van Deursen and Van Dijk (The Netherlands), Eshet (Israel) and Ferrari (EU). Two unique characteristics of the GTCU are: 1) its Epistemological dimension, which relates to computational competencies of high importance to professional “power users” in creative, scientific, technological and information-intensive domains, and 2) its proprietary data-collection instrument, an online application that provides users with a rich and visually engaging digital-competency profile. Digital technology permeates all aspects of human activity and requires everyone to adapt constantly to this evolving “reality.” Because education always tries to remain relevant, digital technology has been introduced in many ways and for a variety of purposes. Again, digital technology required everyone in this field to adapt. However, the specific nature of his adaptation remained unclear. What should learners learn? What should teachers teach? What should teachers know? These basic questions gave rise to the development of many models and lists of learning objectives, skills and competencies from within the field of education, for every group of people involved in the educational process. The original objective of this particular project was, and remains, to develop a model of technological competencies that is consistent with other current educational theories, and completely applicable in any discipline or area of human activity outside of education, and therefore not limited to a pedagogical perspective. The premise is simple: if education is a social project, it should be consistent with all human activity, and so should our view of digital technology. Many existing models and inventories or sets of standards were consulted both in French and in English literature, (i.e. : ISTE Standards; B2i and the C2i certification, [France]) to explore the overall validity of the model. So far, it appears that although there are some variations, all major models are converging on a very similar set of groupings as no matter what the starting perspective was, inevitably, the basic designed functions of the technology itself tend to emerge as framing the general purposes or uses we can make of them. What remains to be seen of course, is with the development of ever newer and different digital technologies, will this model of four orders remain relevant? Based on the works of scholars such as McClellan (1973), Gillet, (1986) and LeBoterf (1999), a competency is considered here to be a set or an array of theoretical and practical knowledge, skills and values that can be readily called upon and put into action in a situation and context that is different from prior situations. Although training may provide initial necessary elements, such competency is considered to develop with varied experience, and with the ability and confidence of the individual to adapt. The uses of digital technology described below imply the development of four orders of competency, either as a prerequisite to making effective and efficient use of the technology, or as a result of using the technology for said purposes. Technical Order of Competency: An array of practical knowledge generally developed through experience with the technology and applied as usable methods to interact effectively and efficiently with the technological object itself. This language, and these commands and skills constitute the knowledge from which a user will select, using specific criteria derived from the analysis of a situation, to plan and use the technological object. 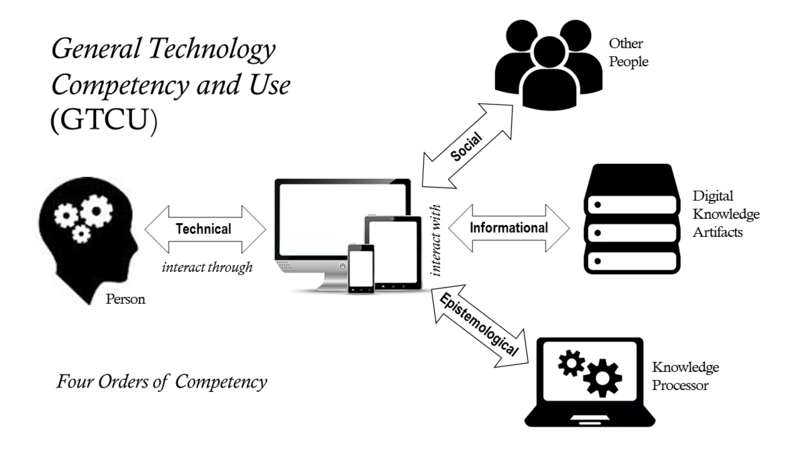 Although these technical competencies are defined separately in this model, they are essential in any use of the technology, regardless of the intent. Social Order of Competency: An array of practical knowledge generally developed by reflecting on communications experiences and centered on a genuine concern for the needs of others, in order to develop and use a strategy of thinking about, and acting with, others online, that is safe, respectful, viable and ethical. Informational Order of Competency: An array of theoretical and practical knowledge generally developed by reflecting on results of a variety of document gathering activities in order to extract usable methods for the aggregation, identification, selection, organization and interpretation of information. Epistemological Order of Competency: An array of theoretical and practical knowledge about a specific discipline or domain generally developed through formal studies or experience and applied as usable methods to use domain specific digital tools effectively and efficiently. This knowledge, translated into operational methods or schemas is required to assign information processing tasks (computational use) to a digital tool (such as a spreadsheet, a database, a photo or music editing system or any other information processing software, including programming languages and authoring systems), for identifying and solving of problems or for the accomplishment of specified tasks. Digital technology consists of a great variety of “computerized hardware” interconnected in broad networks. IEEE defines computer hardware as: “physical equipment used to process, store, or transmit computer programs or data” (ISO/ IEC 24765:2009 Systems and software engineering vocabulary [IEEE, 2006]). From at least 2001, the GTCU has been operationalized through a validated self-report instrument. This instrument now forms the the basis of the second-generation, Digital Competency Profiler. In 2017, a pilot observational study, using the GTCU framework, was conducted in the EILAB. This instrument was initially designed to study the digital abilities of Canadian teachers. Over time, it developed to explore the digital competencies of professors and students at a Canadian, science and technology university, and then of participants at universities in other parts of Canada and around the world. (To date, through international research partnerships, the English indicators has been translated into French, German, Austrian, Ukrainian and Georgian.) These indicators consists of 26 categorized activity items (five for technical, and seven each for social, informational and epistemological), each with two measures: frequency of use and confidence of use, conceptualized as twin, synergistic indicators of digital competence. Frequency of use is considered an important general indicator of competency on the assumption that transferable procedural knowledge, and in many cases, accompanying higher-order abilities, are reinforced through purposeful use of digital devices (i.e., practice leads to acquired ability). Confidence of use, a self-concept addressing one’s capabilities to select and execute courses of action, is directly aligned with self-efficacy. As such, it is considered an important predictor, not necessarily of acquired ability, but rather of an individual’s willingness to pursue new activities, positively address challenges that occur, and extend abilities already acquired. 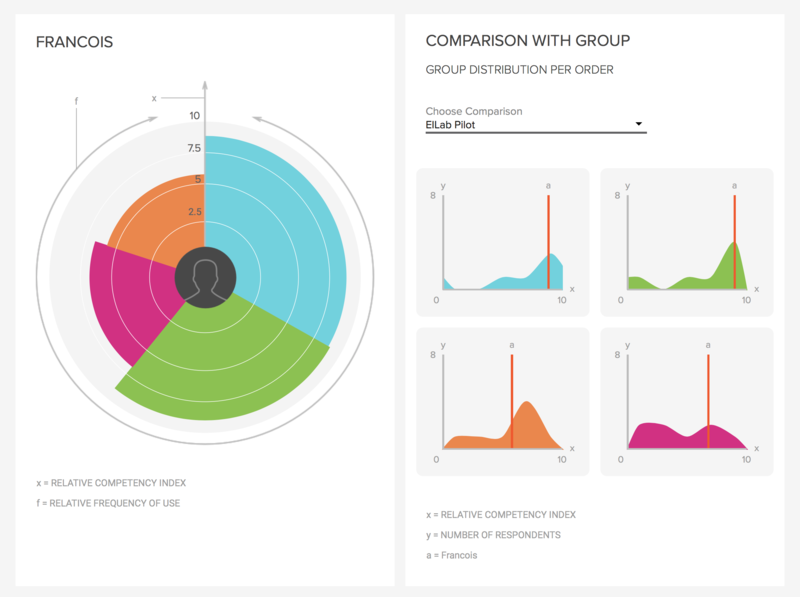 Operationalization of the GTCU continues to develop, and in 2017, the survey instrument served as a basis for the EILAB’s Digital Competency Profiler (DCP), a robust, second-generation, online application for generating and comparing digital competency profiles of individuals and groups. As a persistent database, the DCP is also poised to facilitate cross-contextual and longitudinal studies. The DCP is available free of charge to research partners through data-sharing agreements. Fifteen participants visited the EILAB to complete a randomly-assigned scenario with a tablet. Each scenario was comprised of six tasks mapped to a GTCU indicator and competency type. Both the performance activity and post-activity interviews were recorded digitally using a unique activity-station setup, and task artefacts were gathered as performance outcomes. Analysis was conducted in two phases. In Phase 1, both the audio-video performance data and activity artefacts were coded, assessed and scored. Exploratory correlational analyses showed a pattern of positive relationships between reported competences and performance at the task and scenario levels for two scenario groups, suggesting predictive value for the DCP. For the third group, a positive correlation was found at the scenario level, but negative correlations were found at the task level. In Phase 2, detailed case-studies were conducted, incorporating self-report data, coded performance timelines, and post-activity interviews. Several situational influencers related to problem-solving strategy, device comfort, task difficulty and motivation, beyond the purview of the DCP, were identified. 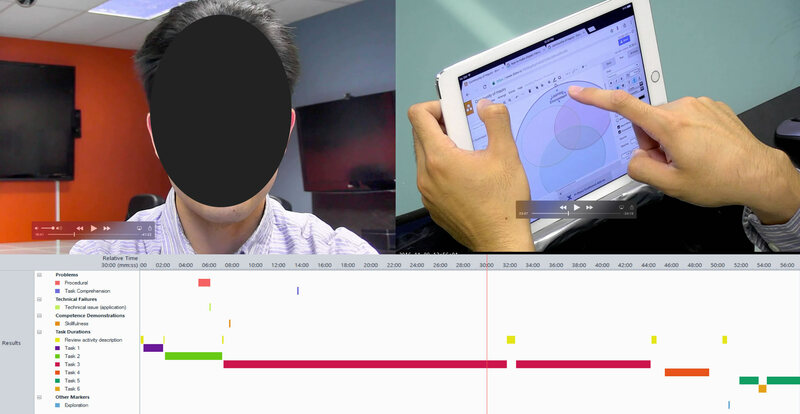 Sample observation video analysis in Noldus The Observer XT. A primary contribution of this study was one of proposing and piloting a techno-methodology for the instigation, multi-perspectival capture, and analysis of authentic human-computer interaction using tablet devices.